After graduating from Marietta College in 1971 with a BA degree, Yvette earned a M.A. degree from West Virginia University at Morgantown, with a thesis in portraiture. Post graduate studies have been with Daniel Greene, Tom Nash, John Howard Sanden, Carl Samson, Susan Sarback, Shalmah Prince, Charles Sovak and David Mueller. A resident of Cincinnati since 1980, Yvette’s favored mediums are oil and colored pencil. She enjoys doing portraits, still life memorabilia portraits and equine, canine and feline art. In equine art, Yvette was invited to paint Nureyev, son of Northern Dancer, and asked to exhibit at the July Sales at Keeneland, Lexington. She has exhibited her equine works at the Camargo Hunters Trials in Cincinnati. She works and teaches at home in her self-designed 22’ X 36’ studio built by her husband, Ed. She also is part of a group of portrait artists who paint the portraits of Fallen Soldiers for the families of these heroic soldiers free of cost. 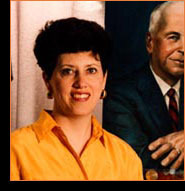 Yvette has exhibited extensively in the Cincinnati area and had a one-woman show at Marietta College in 1992 where she was a featured speaker on “The Business of Art.” Some of her more famous clients have been Marietta College President Emeritus, Dr. Sherril Cleland, former Bengal’s Place Kicker, Jim Breech; Quarterback Boomer Esiason; Coach Sam Wyche, and Cincinnati Red’s Pitcher, Jim O’Toole; Gary Hoffman, President Union Central Insurance. She is represented by The Point Gallery, Prospect, KY. and The Kada Gallery, Erie PA. and Greenwich House Gallery in Cincinnati. Her painting, “The Winner” was selected from 13,000 entries as a finalist in the Artist Magazine’s 2001 Annual Art competition and “Pure Exhaustion” was a chosen from 8,000 entries as a finalist in 2007’s competition. In addition, The Cincinnati Magazine listed her as one of the five portrait artists recommended to their readers. Her painting “Gossiping” was exhibited in the prestigious American Academy of Equine Arts Fall 2000 Showcase of Equine Art and “Where’s the Fox” was selected for Art Show at the Dog Show in Wichita, Kansas in 1999. “My Shadow & Me” won an award in the 2002 Viewpoint Art Show and “Coming & Going” won an Honorable Mention in the LSU International Exhibition of Animals in Art in 2002. She has also exhibited in several ViewPoint juried shows sponsored by the Cincinnati Art Club. Her paintings “Pillow Talk” and “Bridget” were selected for the 2012 Art Project at Bethesda North Outpatient Imaging and Mary Jo Cropper Center for Breast Care. They were displayed for one year. Yvette is married to Edward T. Mazza and they have a daughter, Meredith and three granddaughters.